Five years on from a terminal cancer diagnosis, Gordon Boyle is going strong, thanks to a revolutionary treatment, and has just set up an exciting new business. Gordon, who is perhaps best known as the former CEO of BMMI, first came to the Gulf in 1993 to work for Al Marai in Saudi Arabia. He moved to Bahrain in 1999. A brief stint back in Saudi working in the food industry led him to BMMI, where he stayed for almost 16 years before “retiring” last December. Gordon first realised something was wrong back in 2013, when a back injury, sustained in a boating accident, stubbornly refused to heal. After much prompting from his wife, he finally saw a doctor and the news was not good. Not only had he fractured his spine but scans also showed the likely presence of cancer. A trip to London’s Royal Marsden specialist cancer centre confirmed the suspicion of multiple myeloma – a cancer of plasma cells, a type of white blood cell normally responsible for producing antibodies. Often, no symptoms are noticed initially. When advanced, bone pain, bleeding, frequent infections and anaemia may occur. Without treatment, the diagnosis would, almost certainly, have been a swift death sentence. But doctors suggested using stem cells to fight the disease and Gordon began a gruelling round of chemotherapy to break down his immune system before his own harvested cells could be reintroduced to his body. Five years on, he visits the hospital every eight weeks for follow-up treatment and is grabbing life with both hands. He left BMMI last December, explaining: “I pretty much said to my boss ‘This is not a position for someone with terminal cancer.’ Yes, my treatment has worked and I feel fine but, as a result of it, my immune system is compromised. BMMI has plans for expansion, which would have meant lots of travel, much of it to African destinations where the risk of infection would have been higher, so it made sense for me to step aside. 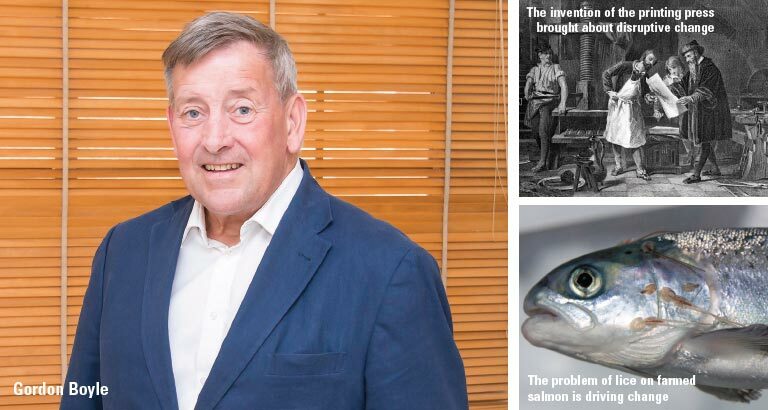 Gordon explains: “I read a lot and I look at what’s happened through history – you see things that’ve happened that you would call a ‘game changer’. For example, approximately 400 years ago there was the invention of the printing press. Prior to that, most people didn’t bother to learn to read and write because there was little for them to read. Books were handwritten and very expensive and mostly used either by the church or government. Then came the advent of printed paper and suddenly people wanted to learn to read and write and life underwent a disruptive change! One of the companies he is working with is involved in Norwegian salmon farming. Issues of lice and pollution affecting the fish have been widely publicised, thanks to the digital age and social media activism, so these forward-thinking entrepreneurs will bring farming operations onto land, where the water environment can be better controlled. Another, is a traditional supermarket in the north of England, which is using his expertise to deliver a brand story aimed at combatting mass production, another extremely disruptive change that’s occurred in the last few decades.